2017 marks our 30th anniversary. 30 years of quality & dependable commercial restaurant hood cleaning. We added an Add Page to our site. It can be found at www.MRJMaintenance.com/AddPage.html. MRJ Maintenance specialises in Restaurant and Commercial Hood Cleaning. The company was started in 1987 and has over 30 years in the Cooking Exhaust Cleaning business. We are located in the Sierra Foothills town of El Dorado (outside of Placerville). From there we routinely service Sacramento, El Dorado, Amador and Placer counties with an extended service area covering Northern California and the San Francisco Bay area. 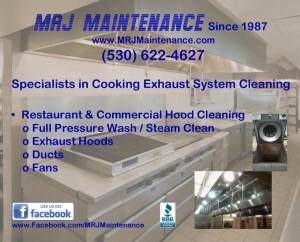 This Blog will center on information, articles and links about Restaurant and Commercial Exhaust Hood Cleaning and obviously promote MRJ Maintenance as your Hood Cleaning company of choice. Visit us on Facebook, Google+ and Twitter for more posts and comments about Restaurant and Commercial Hood Cleaning.